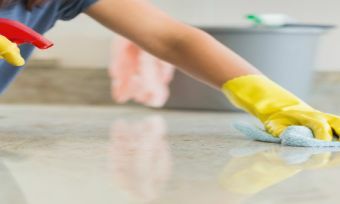 Just think about the variety of cleaning supplies you use: disinfectant spray, laundry detergent, dishwashing detergent, furniture polish, oven cleaner, bathroom and toilet cleaner — the list goes on and on. Then, at the end of it all, you plug in an artificial air freshener and you’re done! I don’t think so. Your cabinets and shelves are probably crammed full of a variety of household cleaners that you could’ve made yourself with just a few basic ingredients you have in the kitchen like bicarbonate of soda or baking soda, and vinegar. And as for the cost? Detergents, soaps and cleaning products may seem like small things, but they’re pricey and quickly bump up your supermarket bill. More natural – some would say ‘old fashioned’ – cleaning products are cheap as chips, and more versatile too. Best of all, your house will sparkle without adversely affecting your children and pets. But back to my situation. I have two problems that led me down this natural cleaning products path. I live on acreage which has a septic rather than a sewerage system, and I have a husband who is sensitive to chemicals and has a nose on him with the olfactory senses of a professional sniffer dog or, as I prefer to think of it, the top odour tester at Chanel perfumery. For those who are unaware, running a house on a septic system means you have to be ultra careful about what cleaning products you are flushing down the drains and toilets (none of that bloo-loo stuff, so-called ‘flushable’ toilet wipes, etc). Harsh chemicals upset the decomposition balance of the toilet’s septic system and can result in the exact opposite of what you’re trying to achieve. Drains, too, spray toxic chemicals out onto your property, killing gardens and seeping into waterways with devastating effects on plant and animal species – the very reason we enjoy the land around us. So, how to step away from the bleach and clean your home? Meet your new best friends – bi-carbonate of soda and vinegar. Cook with them, clean with them, save money with them. I paid $3.70 for 1kg bag of bi-carb and under a dollar for 2 litres of cleaning vinegar at the supermarket. The bi-carb lasts me ages and doubles as a key ingredient in my baking efforts. The vinegar lasts me roughly a couple of months – when I get the cleaning bug, I tend to splash it around liberally! But, hey, I’m not complaining, particularly when the fancy alternatives are around $5 a pop and we are told we ‘need’ all these different products for different cleaning applications around the home. Note that baking soda and bicarbonate of soda are different names for the same thing. In Australia, the term bicarbonate of soda is mostly used and in America, it is referred to as baking soda. You’ll find plain white vinegar amongst the salad dressings at the supermarket but it’s twice the price of ‘cleaning’ vinegar which is in the cleaning products aisle, usually on the bottom shelf. These lift off dirt, grease and dust without the need for cleaning chemicals, because they are formulated to penetrate and trap dirt. There are a number of different brands to choose from and a good quality cloth can last for several years. Look for unscented soap in liquid form, flakes, powders or bars that are biodegradable and will clean just about anything. Avoid using soaps which contain petroleum distillates. Source pure goats milk soap from farmers’ markets. Yes, fresh lemons are one of the strongest food-acids, effective against most household bacteria. Why not grow your own lemon tree in the backyard? Because of the demand, we’re seeing the emergence of new products which are safe and non-toxic. I use dishwasher tablets that are free from bleach and phosphates, plus I use clothes washing detergent made along the same lines. Of the various commercial home cleaning products, drain cleaners, toilet bowl cleaners and oven cleaners are the most toxic. Use the formulas described above or purchase genuine ‘green’ commercial alternatives because, let’s face it, we all have busy lives and convenience products that work within our moral guidelines are good. Besides, I believe in supporting individuals or companies who are trying to do the right thing for the sake of our health and the earth’s longevity. I avoid products containing ammonia or chlorine, or petroleum-based chemicals; these contribute to respiratory irritation, headaches and other complaints. Pour 1 cup vinegar, then 1 cup bi-carb of soda down the drain. The resulting chemical reaction can break fatty acids down into soap and glycerine, allowing the clog to wash down the drain. Let sit for 15 minutes then follow up with 1 cup of boiling hot water to clear the residue. In my experience this will usually be just as effective as the most expensive drain cleaners. Caution: only use this method with metal plumbing. Plastic pipes can melt if excess boiling water is used. Also, do not use this method after trying a commercial drain opener – the vinegar can react with the drain opener to create dangerous fumes. Place a bowl filled with water and 2 tablespoons of bi-carb of soda in your microwave. Cook on high for 1 minute. Remove bowl and wipe down microwave with a clean cloth. Sprinkle bi-carb on the bottom of your dishwasher in between loads. Place a small, open container of bi-carb of soda in your fridge to eliminate those unwanted food odours. This hard-working item often needs a clean up to make it sparkling again. Pour 1 teaspoon of bi-carb in the drain, followed by a splash of vinegar – it should react and cause a bubbling effect which shows you it’s working. Leave alone for 30 minutes if you can. Then clean the sink with bi-carb sprinkled onto a cleaning cloth. Tough stains may need a bit of vinegar on the cloth as well. Rinse with water for a clean bowl and odour-free drain. Give basin, shower, bath drains, as well as the toilet bowl the same treatment outlined above for the kitchen sink. Toilet bowls may need a little extra, say, 2 teaspoons of bi-carb and a heavier splash of vinegar (watch for the ‘bubbling’ to know it’s working). After 30 minutes, clean the toilet bowl with a toilet brush then flush. Soap scum on shower screens will come off with a cleaning cloth containing vinegar (water-based bi-carb paste if stains won’t budge). This is a common problem in tile grout and it can be a health concern. Mix one-part hydrogen peroxide (3%) with two-parts water in a spray bottle on areas with mould. Wait at least one hour before rinsing or using the shower. Tip: Keep this mixture in a dark spray bottle, since light can change the properties of hydrogen peroxide. The truth is, once you get it out of your head that you need your house to smell like a freshly sterilized hospital room, you’ll find your best cleaning supplies right in your own pantry. Baking soda and vinegar will often work to clean just about anything and you know that you’re doing the best thing for your family’s health. After all, why bother using toxic cleaners when the ones Mother Nature invented often work just as well? And they’re way cheaper.